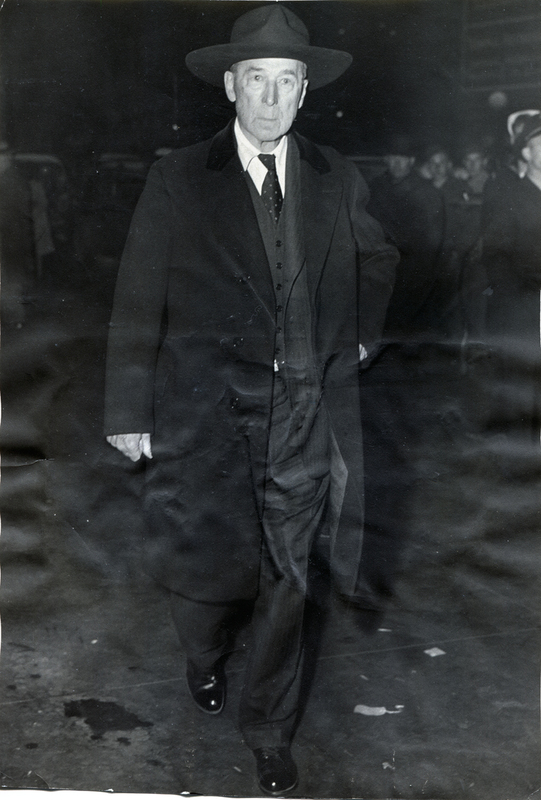 Original Chicago Tribune photograph ("one and only," not a wire service photo) showing William S. Hart's arrival at Chicago's Dearborn Station as he accompanies his sister's body to New York. Note the row of onlookers in the background, probably befuddled by all of the excitement. BW print, 7"x10", single-weight stock, glue/water damaged. Mary Ellen Hart, whose exact birth date is uncertain, lived at the Newhall mansion with her brother until her death Oct. 1, 1943. She is buried at Green-Wood Cemetery in Brooklyn, as is her brother. She was buried Oct. 14, 1943  the same day this photograph ran in the Tribune, as evidenced by the date stamp on the back. As it is a nighttime shot, we may assume the photograph was made on the evening of Oct. 12 (or overnight Oct. 12-13), too late to run in the Oct. 13 edition. 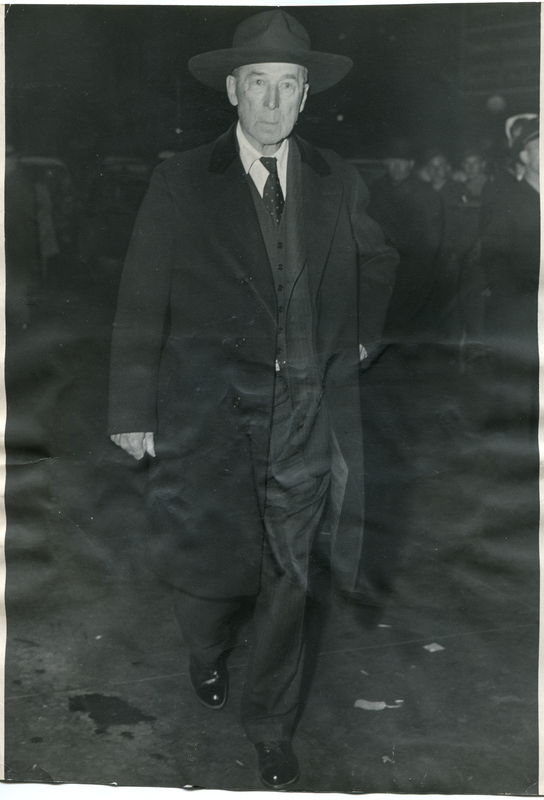 Pix of 2 Gun William S. Hart, as he arrived on the Santa Fe. He is accompanying the body of his sister to New York. Office has story. Dearborn Station operated from May 8, 1885, to May 2, 1971, and served the Atchison, Topeka and Santa Fe Railway, among others. Some of the Santa Fe trains that ran to Los Angeles were the Chief, Super Chief, El Capitan and Grand Canyon Limited. Here is a photo of William S. Hart at the throttle of the Chief as it prepares to leave Los Angeles for the first time on Nov. 14, 1926. The barcode sticker on the back of this print is that of the 2012 photo seller. LW2295a: 9600 dpi jpeg from original print purchased 2012 by Leon Worden.